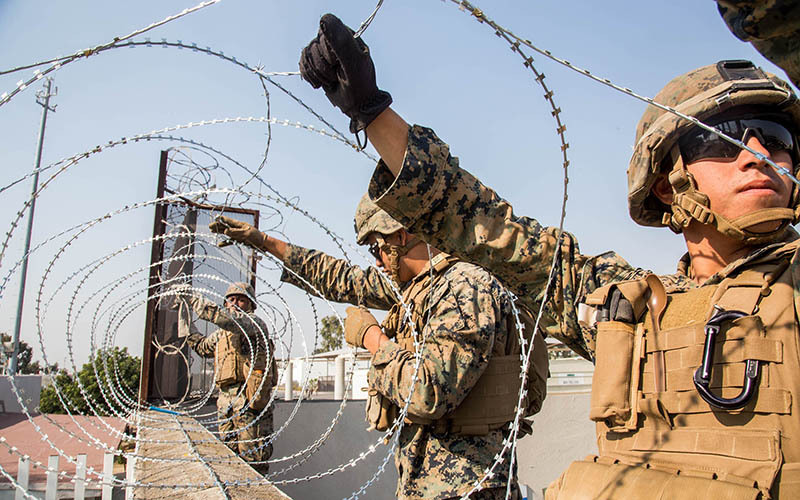 WASHINGTON – Pentagon officials told House lawmakers Tuesday that there’s nothing unusual about the 2,300 active-duty troops at the Mexican border, calling it in line with similar deployments under previous administrations. Undersecretary of Defense for Policy John Rood and Vice Adm. Michael Gilday opened their testimony to the House Armed Services Committee by saying the Defense Department has “a long history of supporting efforts to secure U.S. borders,” beginning in the early 1990s. 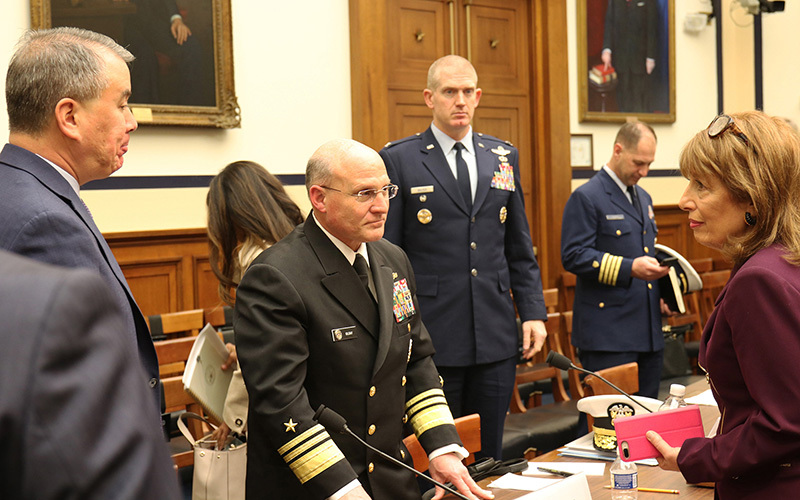 “We believe our military support enables CBP (Customs and Border Protection) to do their duties at ports of entry,” Gilday testified. But most of the earlier deployments cited in their testimony involved National Guard troops, and Democrats on the committee called it “highly unusual” for active-duty soldiers to be on the border providing support. “There’s really not much evidence that right at the moment it is a crisis that would call for the, if not unprecedented, then highly unusual step of sending active-duty troops to the border,” said Rep. Adam Smith, D-Washington, the chairman of the committee. Democrats were further concerned that troop presence would grow if President Donald Trump follows through on his threat to declare a national emergency in order to fund border wall construction without explicit congressional approval. Trump first sent troops to the border in April, when about 2,000 National Guardsmen were deployed by border state governors, with federal funding, to work in support roles for Homeland Security agents. In October, the president turned to active-duty soldiers in response to what he called a threat from a caravan of Central American migrants that was headed to the U.S. At its peak, the deployment included 5,900 active-duty soldiers. None of the troops, active or guard, is allowed to be involved in the apprehension of immigrants. They can only offer support services, such as maintaining vehicles, manning surveillance equipment and helping fortify border barriers and ports of entry. Rood said that troops have so far strung 70 miles of concertina wire, helped with engineering, transported border agents and loaned them protective equipment, among other tasks. The Pentagon recently said soldiers will operate mobile surveillance equipment through at least Sept. 30, and place another 150 miles of razor wire by March 31. Gilday said total cost for active and guard troop deployments will be $448 million for the fiscal year. He said there is “minimal to no additional” cost for active troops compared to guardsmen. Gilday said that this is good training for most of the troops and should have no impact on military readiness but could actually benefit their readiness. Both men said the request to deploy troops may come from Homeland Security, but the decision on whether to respond, and how, is made by the Pentagon and is constantly under review. Republican lawmakers at the hearing said the deployment is a needed, but not unusual, step. “What the administration has done is in line with … the sort of things that we have asked the military to do for a long, long time,” said Rep. Mac Thornberry, R-Texas. Rep. Mike Rogers, R-Alabama, argued there would be no need to deploy troops if Homeland Security was adequately funded. Rogers added that “we continue to act stupid in Congress,” fighting the president over $5.7 billion in border wall funding that led to a partial government shutdown cost the U.S. economy $11 billion. The shutdown ended Friday with passage of a short-term budget extension and an agreement by House and Senate leaders to negotiate on border wall funding. Trump has said that if he does not get the funding he wants, he could close the government again in three weeks or declare a national emergency and draw wall funds from other agencies – possibly the Pentagon. “And I assume it would be,” he said.